If you are staying at the campsite of St. Michel and choose to walk down to the town, then you've got a long walk up again! Si vous séjournez au camping St Michel et que vous allez visiter la ville, votre promenade sera longue pour le retour! Picturesque but daunting. I'd have to rest frequently, enjoying the surroundings as I caught my breath. Eventually, Olivier - at the campsite! A LONG walk. It would be an absolute pleasure to walk up those steps! Ah, but so much to see along the way. I would treasure each step, each time. OH I love this for so many reasons. The purple petals on the gray steps for starters. The winding stairway at the top for another and of course the light. It's always the light. Looks like a good opportunity to get some exercise. Jilly, you show these steps very nicely. It is hard to take a two-dimensional photograph of steep terrain and convey the depth. Usually the image flattens out and disappoints, but this one does not. Good job. I like this new bi-lingual style, Jilly. It is helping me so much with trying to think in French rather than simply translate word for word. Please thank your neighbour! 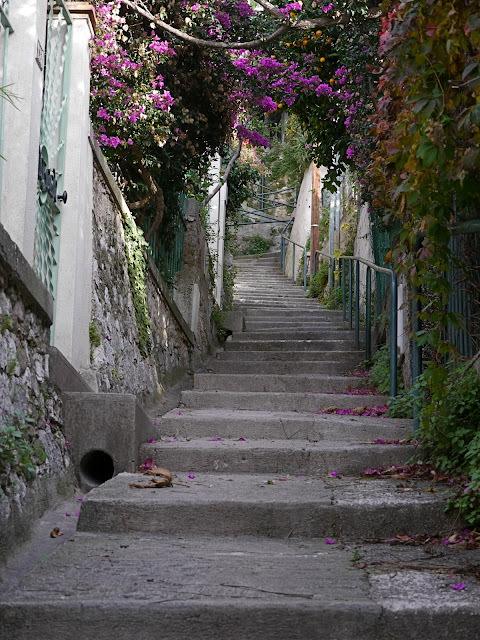 It reminds me of the path up from the station in Grasse. It starts as Traverse de la Gare and terminates waaaaay up the hill as Traverse Victor Hugo. Daunting, but with a tremendous sense of accomplishment at the top! it may be long, but it looks like a lovely walk!!! Better not forgrt something.....and taking just what is necessary for the beach.